In the Movement unit we will learn that muscles allow us to move. Smooth muscle and cardiac muscle move to facilitate body functions like heartbeats and digestion. We will also learn the movement of these muscles is directed by the autonomic part of the nervous system—those are the nerves that control organs. Skeletal muscles move our bodies in space. They take direct instruction from the specific nerves that innervate each muscle. Want to learn more about the muscles in the human body? Here are five other facts to keep in mind about the muscular system. The roles of the musculoskeletal system are movement, support and protection. Bones act as levers so the body can move and provide structural support (skeleton). Ligaments are strong bands that connect bone to bone strengthening the joint during movement. Tendons have dense connective tissue that connects muscles to bones, allowing movement of the bone when a muscle contracts. Levers are classified by first, second, and third class, depending upon the positions among the fulcrum, the effort, and the resistance. First-class levers have the fulcrum in the middle, like a seesaw. 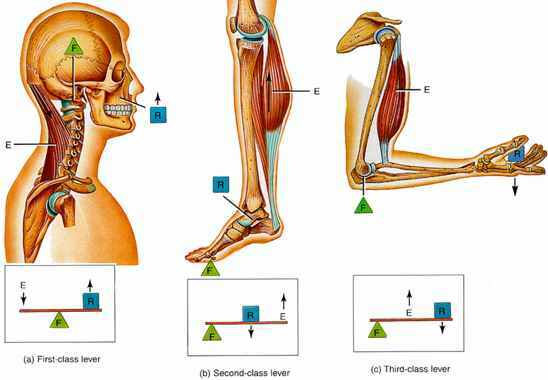 An example of a first class lever is when a human nods their head (top of the spinal column is the fulcrum, the effort force is provided by the muscles in the back of the neck, and the resistance is weight of the head). Second-class levers have a resistance in the middle, like a load in a wheel-barrow. The body acts as second class lever when engaged in push up or calf raise. During a calf raise ball of foot is fulcrum, the body’s mass is the resistance and the effort is applied by calf muscle. Third-class levers have the effort from the muscle in the middle of the lever. The majority of the human body's musculoskeletal levers are third class. These levers are built for speed and range of motion. Muscle attachments are usually close to the fulcrum. In the example of the arm, the effort force is provided by the contraction of the biceps, the fulcrum is the elbow joint and the resistance would be provided by whatever weight is being lifted. 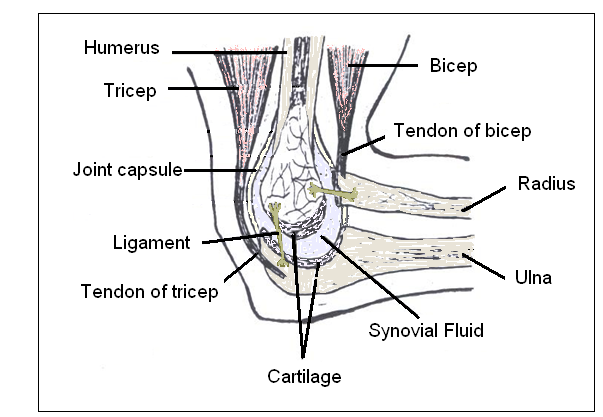 The type of joint determines the amount of movement that is possible. For ball and socket joints, such as the hip or the shoulder, movement through all three planes are possible. At the hip joint, the head of the femur is the ball the fits into the socket of the pelvis. The movements possible at the joint are flexion, extension, rotation, abduction and adduction.. For hinge joints, such as the knee, flexions (bending) and extensions (straightening) are the possible movements (movement in one plane); however, slight side to side movements are possible. Skeletal muscles occurs in pairs that are antagonistic. This means that when one contracts, the other relaxes. 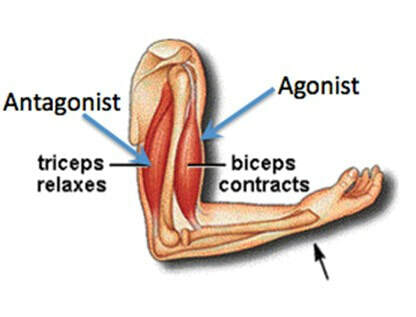 Antagonistic muscles produce opposite movements at a joint. 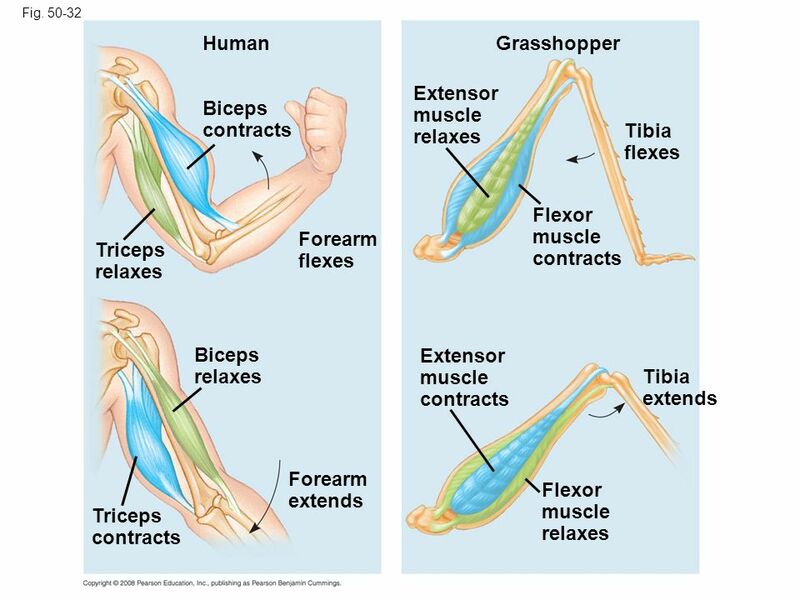 For example, in the elbow, the triceps extends the forearm while the biceps flex the forearm. A whole skeletal muscle is considered an organ of the muscular system. Each organ or muscle consists of skeletal muscle tissue, connective tissue, nerve tissue, and blood or vascular tissue. Skeletal muscles vary considerably in size, shape, and arrangement of fibers. They range from extremely tiny strands such as the stapedium muscle of the middle ear to large masses such as the muscles of the thigh. Some skeletal muscles are broad in shape and some narrow. In some muscles the fibers are parallel to the long axis of the muscle; in some they converge to a narrow attachment; and in some they are oblique. The sarcoplasmic reticulum stores calcium - between myofibrils are large numbers of mitochondria, which provide ATP needed for contractions. A skeletal muscle is made up of many multinucleate muscle fibers (cells), each of which runs the entire length of the muscle and is connected to at least one motor neuron. Each muscle fiber contains multiple bundles of contractile protein called myofibrils. Myofibrils made up units called sacromere, strung out in single file along the length of myofibrils. The ATP undergoes a hydrolysis reaction forming ADP + Pi. This causes a positional change in the myosin head (cocked back). When the ADP + Pi are released the myosin heads change conformational position, sliding the actin filaments towards the center of the Sarcomere. This is called the “power stroke”. After the power stroke ATP again binds to the myosin head, causing it to detach from the actin filament ready for another cycle. An action potential propagated along a motor neuron arrives at the neuromuscular junction. This causes the release of the neurotransmitter acetylcholine into the synapse between the terminal axon of the motor neuron and the sarcolemma of the skeletal muscle. The acetylcholine binds to receptors on the sarcolemma, causing voltage-gated channels to open and Na+ ions to flow into the muscle cells. This creates an action potential in the striated muscle. The action potential is further propagated along the sarcolemma of the skeletal muscle. The action potential moves into the interior of the muscle cell through folds called t tubules. The depolarization of the t tubules causes voltage-gated Ca+ channels on the sarcoplasmic reticulum to open, causing an influx of Ca+ ions into the sarcoplasm. ​Notice in the fully contracted sarcomere the actin filaments slide along the myosin causing the light bands to shorten, even though the dark bands stay the same length. The Z lines get closer together as the sarcomere contracts.. The muscle also can be in various states of partial contraction. 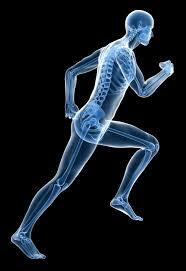 ​Movement of the body's skeleton is made possible by a number of body parts working together including the joints. A hinge joint at the elbow allows the arm to bend and extend. The condylar joint at the knee gives similar movement plus some rotation. Mobile ellipsoid joints between the fingers and palm of the hand allow circular movements but no rotation. Ball-and-socket joints, like the one at the shoulder, give maximum freedom of movement. At the other extreme, plane joints between the toe bones permit only a small degree of gliding movement and the pivot joint between the two cervical vertebrae-the atlas and the axis-merely provides rotation of the head. The saddle joint at the ankle is almost as mobile as the shoulder joint, but rotation is far more limited. ​Each time you take a step, 200 muscles work in unison to lift your foot, propel it forward, and set it down. It’s just one of the many thousands of tasks performed by the muscular system: this network of over 650 muscles covers the body and is the reason we can blink, smile, run, jump, and stand upright. So how does it work? ​We continue our look at your bones and skeletal system, skipping over the silly kid's song in favor of a more detailed look at your your axial and appendicular skeleton. This episode also talks about the structural and functional classifications of your joints and the major types of body movement that they facilitate. ​We're kicking off our exploration of muscles with a look at the complex and important relationship between actin and myosin. Your smooth, cardiac, and skeletal muscles create movement by contracting and releasing in a process called the sliding filament model. Your skeletal muscles are constructed like a rope made of bundles of protein fibers, and that the smallest strands are your actin and myosin myofilaments. Its their use of calcium and ATP that causes the binding and unbinding that makes sarcomeres contract and relax. ​Hank calls in a friend to do his push ups for him today to explain how skeletal muscles work together to create and reverse movements. Hank and Claire also demonstrate the role size plays in motor units, the three phase cycle of muscle twitches, and how the strength and frequency of an impulse affects the strength and duration of a contraction. This episode also explains twitch summation, tetanus, and isotonic vs. isometric movements.